The Ford Taurus is a four-door, five passenger full-size sedan. The Ford Taurus is manufactured in Chicago, Ill. alongside the Mercury Sable and Lincoln MKS. There was a time when the Ford Taurus was the best-selling automobile in the North American market. Introduced in 1986, the Taurus provided mid-size sedan buyers with reliability, reasonable performance and excellent value for their dollar. As time went on, Ford’s Japanese competitors caught up in terms of quality and features, and buyers began to slip out of Ford showrooms and into shiny new Camrys and Accords. A dramatic oval-inspired re-design in 2000 further alienated Taurus customers and pushed the car farther away from the sales peak it had once rested upon. For 2008, Ford has decided to rejuvenate the Taurus by essentially giving the vehicle a completely fresh start. Appropriating the vehicle formerly known as the Ford Five Hundred, the new Taurus replaces that poorly selling sedan as Ford’s mid-size offering, a move that the company hopes will pay off through cashing in on the Taurus’ brand recognition. The Taurus has the now-familiar Ford three-bar center grille, and the rectangular styling extends back along gently creased side panels to end in an upright rear end with triangular tail lights. This gives the vehicle a somewhat pedestrian but not unattractive appearance. There are only two trim levels that can be ordered. The Taurus SEL comes equipped with Ford’s 3.5 liter Duratec engine which produces a healthy 263 horsepower via dual overheard camshafts and 4 valves per cylinder. This places it within range of both Honda and Toyota mid-size sedans, and lets the Taurus hit 60 miles per hour from a standing start in 7.6 seconds. The Duratec is mated to a six-speed automatic transmission. The SEL also features an optional Ford Sync multimedia management system, which was co-developed with Microsoft, as well as a leather wrapped steering wheel, 17-inch wheels and dual exhaust tips. The Limited version has more standard equipment, but not much more – both vehicles are very similarly equipped, and both have almost identical options. Either can also be had with either front-wheel or all-wheel drive. Inside, the Taurus has ample space for 5 adults, and the rear seats are quite comfortable. A generously sized trunk can be combined with the folding rear seat to haul quite a bit of cargo, making the new Taurus an improvement over the outgoing model in both these respects. The interior feels more upscale than the previous generation, and this helps it stand up against the class leaders in terms of materials quality and fit and finish. From a driving perspective, the Taurus makes excellent use of its newfound horsepower, with a smooth-shifting transmission and a decent suspension setup. Combining all-wheel drive with the option of electronic stability control gives the driver excellent confidence when piloting the Taurus through snow and other adverse weather conditions. 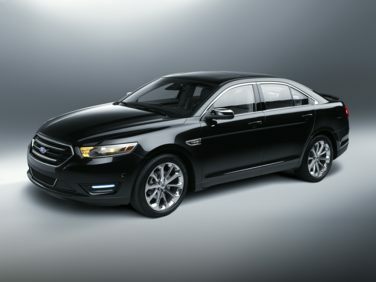 Ford has done a good job of re-positioning the Taurus to give it new life in an increasingly competitive sedan market. By giving the vehicle the attention to detail that it required in order to vault it back onto the shopping lists of families across North America, the automaker looks to be in a solid position for the introduction of the next generation Taurus in 2010. The 2009 Ford Taurus is a carryover from 2008. The 2009 Taurus is available in three different trim levels. The SE, SEL and Limited all make use of the same 3.5 liter V6 engine that produces 263 horsepower and 249 lb-ft of torque. In front-wheel drive configuration, the engine’s fuel economy is rated at 18 miles per gallon in city driving and 28 miles per gallon on the highway. This number drops to 17 miles per gallon in the city and 24 miles per gallon in highway cruising when the Taurus is equipped with all-wheel drive, which is an option on the SEL and Limited trims. All versions of the Taurus us a 6-speed automatic transmission.